Previous PostPreparing for Mana Regen Changes in 3.2Next PostWell, that’s not frustrating at all. Actually Divine Guardian is “fixed” in 3.2 so I’m not sure anyone will want to take a look at this spec anymore.Even when you have Divine Shield up it’s capped at 150% of your health, which doesn’t add up to very much mitigation. I’ve been pushing the holy paladins I know to do this since Divine Guardian became a talent! A great place for some of those extra talent points is Blessed Hands – increases the absorb of Divine Sacrifice. I love my crit spec. I love seeing 24K Holy Lights, and the occasional 12K Holy Shock (those REALLY surprise me when they happen, must have wings popped when that happens). I love hearing our Holy Priest call that he’s almost out of mana, and seeing my own mana bar at 40%, even though I’ve been healing big. Still, as we delve deeper into Ulduar, I’ve been feeling the call of the Divine spec, and it’s getting harder to resist. Nice to see you back, btw. This is the spec I’m carrying as my dual spec, and will be using it this week in 25 man Ulduar, since I now have 4 pieces of Tier 8/8.5 armor. After which I will be re-crunching my mana numbers to see if they’re all that different from the 51/0/15 +5 spec I’d been using (as my raid’s buffbot, I have some talents most holies don’t usually have to pick up). While I don’t expect to see a whole lot of change, I’m hoping to see a little less doom in the calculator if I’m going more towards mitigation and throughput. The idea of more Divine Sacrifices being used in my guild’s raids makes me very happy. I am this spec already but instead of 3 points in ret, I put it in the Improved Devo since sometimes we don’t have a prot pally in our 10 mans. I haven’t had the privilege of getting 4 pc T8 but I don’t really miss the 51/5/15 spec much. 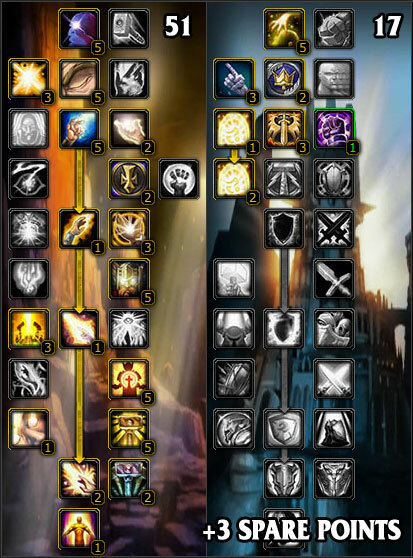 My Pally has been the above spec with the 3 extra points in Imp Devo Aura (as we’re frequently without a Prot Pally or Resto Druid in her raids) since 3.1 hit. Divine Sacrifice is really awesome, and Divine Guardian makes HoSac good enough to use as a tank cooldown without the need of a backup. Btw, nice to see you posting again. I always enjoyed your posts in 3.1 and I’m glad to see you have returned. Haha, aw. [quote][/quote] doesn’t work. Sorry for the borked comment. This is pretty much my spec, I swapped from a standard 51-0-20 for doing 10man hard modes and I’m really enjoying it. My regen is a little lower, but the extra raid utility is amazing. I wouldn’t bother putting points in to Righteous Fury though, the second you start spamming some big heals you’re going to pull aggro even off a geared tank, and any fights with adds (Freya) just forget about it. I put those points into Toughness for the reduced movement slowing. Interesting spec – I toyed around with a variation of that (I prefer to take aura mastery than max Infusion / enlightened judgments). Now I’ve got the 4pt8 (which I equivocated on taking for a long time) it might be worth another look. I am guilty of underutilising SS too. Would you take benediction or IDA? I have gone with this spec, and in 10 man Ulduar am really liking it. I DO put my points into Righteous Fury for the damage reduction and NO your threat from heals is not boosted, I’ve tested this a number of times. This does not mean, however, that your judgements will not be very threaty, but that’s still nothing in the grand scheme of things. Blessed Hands! Aura Mastery! Don’t take Benediction or Imp Devo! Blessed Hands improves the absorb of Divine Sacrifice and improves the performance of your Hand spells. You’re speccing holy/prot to get Divine Sacrifice, why not maximize it’s effectiveness? BLESSED HANDS AND AURA MASTERY IN 3.2! YES WE CAN! Um…blessed hands doesn’t improve the absorb of Divine Sac it only improves your Hand spells. I fear that Alex may indeed be correct. Of course the great limitation (on both DS and HoS) is that they are capped at a maximum of the paladin’s health. I don’t believe that blessed hands increases that cap, only the amount transferred (up to 40% from 30% on HoS). In any event, since in most raid situations where DS or HoS would be useful much more damage than 150% of max health is flying around, the effectiveness of blessed hands is probably pretty limited. Totally with you on aura mastery though – I have that instead of 2 points in enlightened judgements (I respecced to max infusion again just last night – we’ll see how this goes). D’oh. I’ve been reading Hand of Sacrifice as Divine Sacrifice for months. Regardless, still bumps up the absorb on Hand of Sac! I’m still behind that spec, despite my inability to read. This is indeed a very good spec. I have been running it since week two of 3.1 and am loving it. I kept a holy/ret build coupled with T7.5 as my offspec for certain 25m hardmodes(Thorim, IC), but after gaining some more ulduar gear I can MT heal through these fights with 54/17/0 wearing 4P 8.5 with no problems. I’ve been using this spec on my paladin since 3.1 as well. Since most paladins use the Holy/Ret build this lets you add something more to the table instead of being just like everyone else.